Our wood cabinet line is manufactured locally by Out Of Sight Cabinets in Littleton. Out Of Sight has been in the cabinet, closet, and storage solutions business for more than 15 years and builds what we feel are the best value in wood cabinets available in our market. Each installation is specifically designed for your space and unique requirements … whether you want the cabinets tall or short, deep or narrow, with or without drawers, etc. 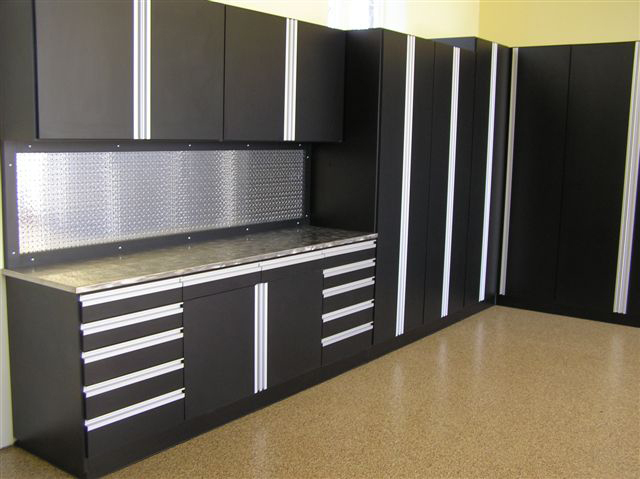 Beautiful workbenches are often incorporated with matching melamine, butcher block or stainless steel tops, and other custom storage needs such as overhead racks and slat wall for hanging tools can be included. FOR A FREE ESTIMATE AND PERSONALIZED DESIGN!